Juliette MacIver and Sarah Davis are incredibly talented in their own rights, but when they combine their talents they create magic. Juliette and Sarah have previously worked together on the wonderful Marmaduke Duck books for Scholastic, and when I heard they were collaborating on a new picture book for Gecko Press I knew it was going to be a great book. In their new picture book for Gecko Press, Toucan Can, Juliette and Sarah introduce us to a very colourful and talented Toucan. Toucan can do lots of things! Can you do what Toucan can? One of the things I like the most about Toucan Can is that it addresses the reader and engages you. You’re asked ‘Can you do what Toucan can?’ and Juliette suggests there are many things that you can do that Toucan can not. Sarah’s illustrations also bring the focus back to the reader. As Toucan and his friends dance, juggle, flip and flop, they’re looking out at you from the page. Everyone should go out and grab a copy of Toucan Can to treasure and read again and again. It is certain to add colour and laughter to your life and will have you dancing along with Toucan and his friends. I absolutely love these books! books though is that they are perfectly suited to the age group. home library and would be an absolute hit in preschools. What would you do if a choking, thick, black cloud of pollution covered your home? Would you sit back, worrying, and wait for it to go away and for someone else to sort it out, or would you want to find a solution? In Kyle Mewburn and Sarah Nelisiwe Anderson’s new picture book, Luther and the Cloud-makers, this is the issue that Luther and his family face. At the end of a wide, green valley lies a secret village, full of laughter and singing…until one day the clouds come. As the clouds gather, turning day to night, Luther sets out to find the cloud-makers and make them stop, before it’s too late. He meets many cloud-makers along the way, but can he convince them to see the error in their ways? Luther and the Cloud-makers is a powerful story with an ecological theme, about a boy who stands up for what he believes in. It shows children that even one small act can make change happen and make the future brighter. When everyone in his village is sitting around feeling sorry for themselves, Luther decides to do something about the problem and make the cloud-makers stop. It’s a unique take on the ecological and environmental theme that will entertain and educate readers. Sarah Nelisiwe Annderson’s illustrations for Luther and the Cloud-makers are superb and really suit the tone of the story. I love the way that Sarah has contrasted the colours throughout the book. At the beginning of the book there are lots of bright and vibrant blues and greens to highlight how clean and fresh the village is. Then the oozing black clouds appear and bring darkness to the landscape. When Luther meets the cloud-makers Sarah has used lots of red, orange and black to highlight the danger and evil nature of the cloud-makers and their pollution. When he finally gets to the city, almost all colour has disappeared, to be replaced by grey and black. It’s on the last few pages that Sarah gives your eyeballs a wake-up call. One of the things I really like about Sarah’s illustrations is the way that she frames them and uses different panels on the page. One of my favourite examples of this in the book is when everything goes dark in the village and the animals become confused. This style will certainly appeal to older children who like graphic novels. I’d actually really like to read a graphic novel (or even a wordless picture book) written by Sarah. 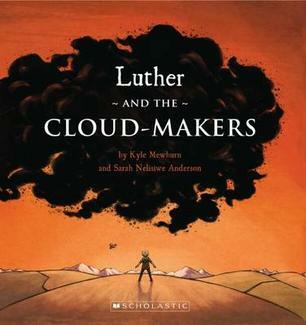 Luther and the Cloud-makers is a wonderful picture book to read to children young and old, and it’s a must-have book for teachers. Do picture books about princesses and queens make you want to tear your hair out? Your little girl may like to be endlessly read stories with sparkles on every page, but if you have to read it one more time will you go insane? Well Juliette MacIver and Lucia Masciullo have just created a picture book about a queen that adults will enjoy just as much as children. It’s called Queen Alice’s Palaces. Queen Alice has a palace that’s ‘gilded and grand’ while poor, hard-done-by Sir Hugh has a castle that’s ‘crumbly and small.’ Dastardly Sir Hugh hatches a plan to get his own palace – he’ll get Queen Alice to build a palace of ‘stunning design,’ then he’ll steal it, ‘by means of a military coup.’ Queen Alice constructs a series of unique palaces, made from bamboo, ice, cheese and other strange building materials. Can she outwit Sir Hugh or will he steal his own palace? Queen Alice’s Palaces is a rollicking picture book filled with imagination, wonder and humour. Juliette and Lucia have let their imaginations run wild and built all sorts of wonderful, if slightly impractical, palaces. Juliette’s rhyming text bounces along, making it a joy to read aloud. As with Juliette’s other books (Marmaduke Duck and the Marmalade Jam), you need to warm up your mouth because you find your mouth doing gymnastics and getting tongue-tied as you read. Just the title alone gives your mouth a good work out. I love Juliette’s use of language too, like ‘gilded and grand’ and ‘cunning, conniving and callous.’ I think it’s wonderful when you can read a picture book and learn new and interesting words. Lucia Masciullo’s illustrations are the perfect match for Juliette’s text. I really love the way that she has portrayed the characters, especially the ‘cunning, conniving and callous’ Sir Hugh. He looks very villainous and his creepy little mustache makes me laugh every time (especially when he twirls it). He will appeal to the boys, while the very glamourous Queen Alice will appeal to the girls. Lucia clearly had a lot of fun creating the palaces, which all look spectacular. There is certainly plenty to discover in the illustrations on each page. Warm up your mouth, fire up your imagination and share Queen Alice’s Palaces with the children in your life. Joy Cowley has written many wonderful stories throughout the years and she has created characters that children have grown up with. I don’t think you can go through primary school in New Zealand without reading one of her junior readers or being read one of her picture books. 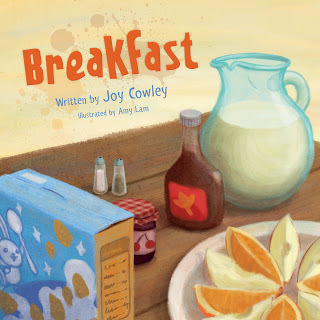 Clean Slate Press have published many of Joy’s stories and they’ve just released a delightful new picture by Joy Cowley and illustrated by Amy Lam, called Breakfast. Each morning the breakfast dishes get themselves ready for breakfast. The jug gets all the dishes and cutlery, table and chairs ready for the noisy, messy children that come racing downstairs for breakfast. After yet another ‘breakfast war,’ the children leave ‘jam in a puddle and milk in a pool’ as well as bent spoons and broken cups and plates. When the children are gone, the breakfast dishes clean everything up and fly into the dishwasher with smiles on their faces. Breakfast is a story that children (and parents) will be wishing was true. If only all your dishes would magically transport themselves to the dishwasher when we leave the room! Joy has taken an everyday occurrence and turned it into a magical experience. Children will have a good giggle at the antics of the breakfast dishes, while parents will relate to the chaos of breakfast time. It’s a simple story with rhyming text that makes it great for sharing with younger children. Amy Lam’s soft, but colourful illustrations are the perfect match for Joy’s text. The dishes all look happy, and even when they’ve been battered and bent, they’re ready to jump back in the dishwasher and do it all again tomorrow. I love the cover with the splash over the title and it’s sure to stand out on the shelf. Clean Slate Press have once again produced a beautiful hardcover picture book, with very cute end papers. Breakfast will make a great addition to any school or home library. I’ve been a huge fan of Leo Timmers ever since Gecko Press first introduced us to his work when they published Who’s Driving? Each book of Leo’s that Gecko publishes seems to be funnier and more clever than the last. Leo’s latest book from Gecko, Bang, is his best yet. Bang is virtually wordless but Leo Timmers proves that you don’t need words to tell a hilarious story. It all starts with a book-loving deer who is driving his car while reading. Everyone knows that’s a bad idea and that it’s not going to end well. What starts off with one ‘Bang,’ quickly escalates into a multi-vehicle pile-up, with animals, food, clothes, and paint ending up in one huge mess. I absolutely love this book! Leo brings his characters to life in his characteristic, vibrant illustrations. I love how each of the animals have their own distinct personality and a vehicle that seems to be a perfect match for them and their outfit. The cat has a very small, pink car and the rabbit has a very long car to fit all her children. Leo’s characters also have very expressive faces that portray all sorts of emotions throughout the story, from the horrified expression of the pig before he crashes, to the stressed expression of the mother rabbit. There is a wonderful sense of anticipation throughout the whole book. Each time a new character crashes you wonder what effect it will have on the other characters, and it often has unexpected results. The sign of a excellent picture book is being able to turn the page and not know what will happen next. Just when you think you know how the story will end, Leo surprises you. Each time you read the book you’re bound to find some quirky detail you didn’t see last time. The book has been beautifully produced by Gecko Press, with delightful end-papers and the wonderful fold-out page right at the end. One of the reasons I love Gecko Press picture books is that they produce beautiful hard-back editions that will be treasured for many years, and this book is no exception. Bang is a picture book that adults will love just as much as children and you’ll want to read it again and again. Thank you Gecko Press for bringing us the magic of Leo Timmers! Thanks to Gecko Press I have a copy of Bang to give away. All you have to do to get in the draw is enter your name and email address in the form below. Competition closes Friday 10 May (NZ only). What do you get when you bring together the author of weird and wonderful stories, Lemony Snicket, and the award-winning illustrator Jon Klassen? You get The Dark, a whimsical tale with stunning illustrations about a boy who is afraid of the dark. Laszlo is afraid of the dark. He lives in a big house, with a ‘creaky roof, smooth, cold windows and several flights of stairs.’ The dark also lives in this house and it hides in lots of different places. Laszlo thinks that if he visits the dark in the dark’s room, maybe it won’t come and visit Laszlo in his room. However, one night it does come and visit Laszlo and tells him that it has something to show him…down in the basement. The Dark is a unique take on the theme of being scared of the dark and it’s a wonderful collaboration between these two very talented people. Jon Klassen’s illustrations are the perfect match for Lemony Snicket’s delightful and humourous text. I really love Jon’s illustration style as he achieves so much with very little detail. The way that he has contrasted the light and dark in this book is spectacular. The dark is a character in the story and I love the way that Jon has portrayed this, especially when the dark is hiding in the cupboard or behind the shower curtain. Some of the pages are almost completely black, apart from Laszlo and the details that we see in the beam of his flashlight. The text has a uniquely Lemony Snicket style and tone, and it certainly took me by surprise. I love the language that he uses to describe the house and the dark itself. If you know a child that is scared of the dark, The Dark, is the perfect reassuring story to read to them. It’s also the perfect book for Jon Klassen fans who will be drooling over his illustrations.